Once used for sports and games, the newly planted Queen Anne Gardens are starting to bloom. 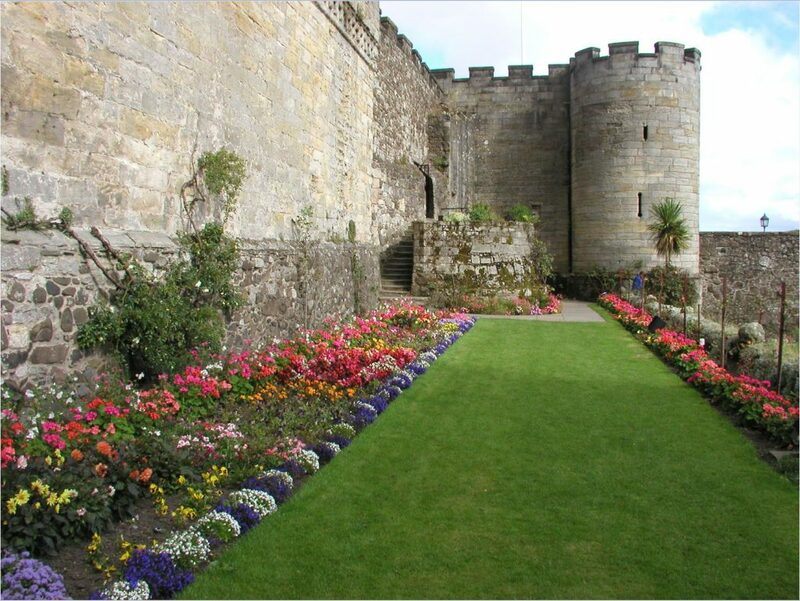 But it’s no bed of roses gardening in a castle! This month we’re looking at the history of games, leisure and tourism in Scotland so we thought we’d take the opportunity to talk about one of Britain’s favourite leisure activities: gardening. 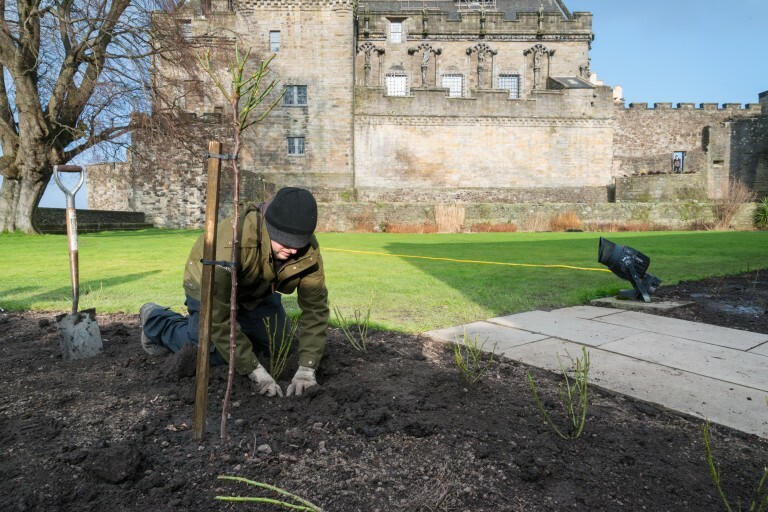 We spoke to Holyrood Park and Garden Manager Alan Keir, who has been gardening for HES since 1976, about recent works to reinvigorate the Queen Anne Gardens at Stirling Castle. The Queen Anne Gardens have a long and interesting history. They may have been created as early as the 1400s for the Royal Stewarts to relax in. For a time they were known as the Bowling Green because officers serving under Queen Anne used this area for bowling when off duty. The gardens might also have been used for games of tennis or football. 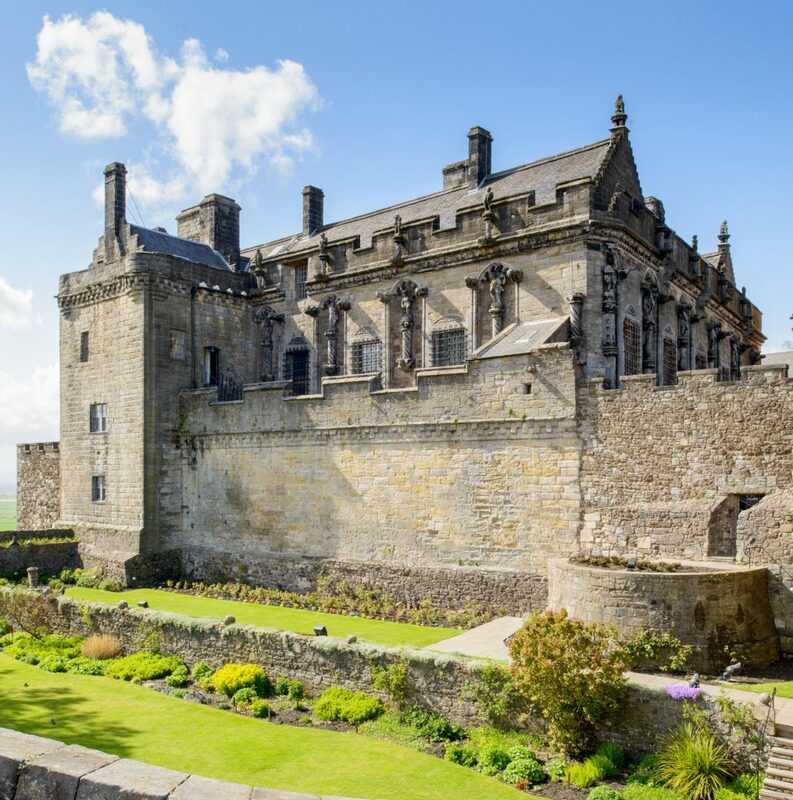 The world’s oldest football was found at Stirling Castle, lodged in the rafters of the Queens Chamber, during works in 1981. It’s over 475 years old and can be seen at The Stirling Smith Art Gallery and Museum. 1. What’s it like gardening in a place with such history? Obviously we’ve got to through all the scheduled monument and listed building consent processes and just be aware of anything significant in the garden. By the James IV Tower there is a small Argyll and Sutherland Highlanders memorial garden. We looked at that very sensitively. We certainly weren’t going to take any of the roses out from there, because they’ve been donated by families. 2. Are these sort of challenges something you’re used to at Holyrood? We have a lot of archaeology at Holyrood, especially in the gardens, so we have to be careful. The team are experienced and knew what to do if we did uncover anything. 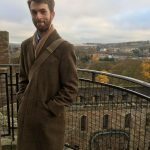 A few years ago, there were some human remains uncovered when work was being done at Holyrood. It was a plague pit which we weren’t aware of. So we had to stop and call in the specialists. But as far as we know there are no graves in the Queen Anne Garden! We are also very considerate about the root depths of the plants we are selecting. We don’t want anything too deep rooted that might disturb unknown archaeology. 3. What can you tell us about the new garden design? 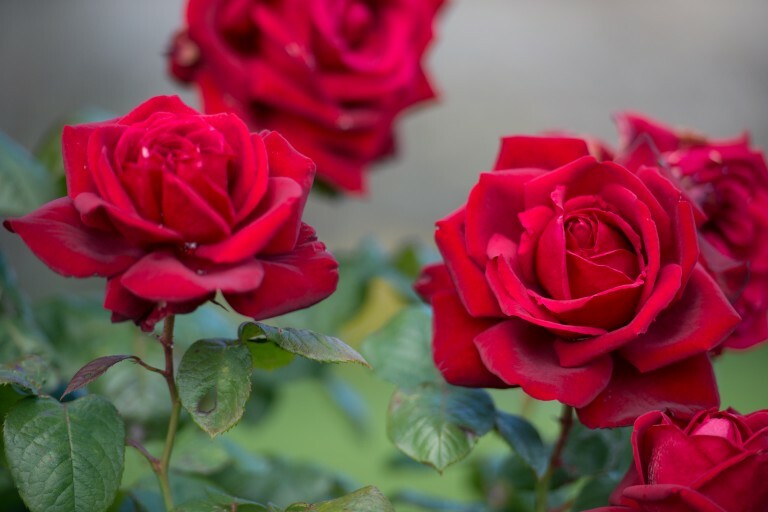 Stirling is a Stuart castle, so we selected Stuart colours of red and yellow for the Rose Beds. Yellow ‘Top Rose’ and red ‘Trumpeter’ roses for the main beds. We planted two yellow beds and a central red bed then Standard Roses right down the centre, alternating red and yellow. In selecting these varieties we’ve also ensured they suit the conditions of the gardens here so they should last 25 – 30 years. We like to keep the floral interest as long as possible. The roses are perpetual flowers so they should flower all summer. The herbaceous beds will extend the season with earlier spring flowers and later autumn flowers and plants for winter interest and some scent. 4. 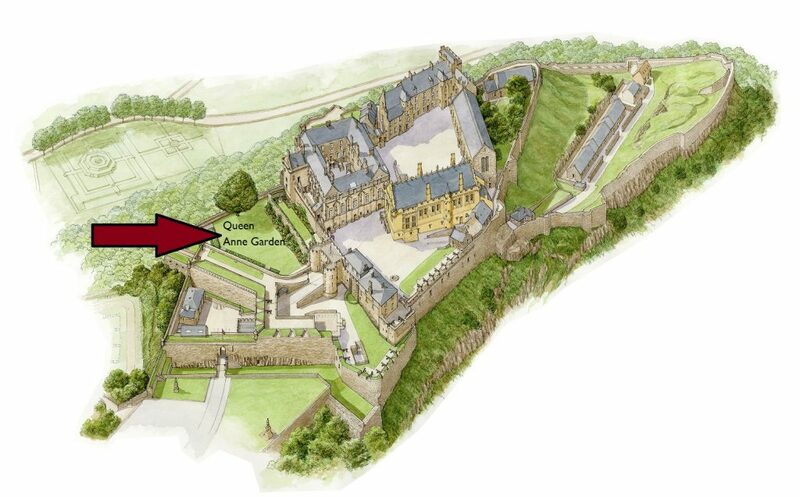 Were there any other considerations in planning the gardens? We are very aware of biodiversity, so we chose plants that would draw in bees and butterflies. This will benefit the wildlife as well which is important to us at HES. Wherever possible we encourage and enhance biodiversity. For instance if a tree is dead, rather than fell it we would keep it for bats and beetles to colonise – where appropriate! Many of the plants in the herbaceous beds were selected for their historic significance. There are plants that were traditionally held to have medicinal benefits or provided protection from ill fortune. For example, Thyme was used as a hangover cure. Several of the plants have labels with information like this. We’ve brought in our own recycled compost too from Holyrood. This went in with the new roses and organic fertiliser. When we first came to the garden soil tests showed little or no nutrient so we’ve taken steps to help bring a bit of life back. 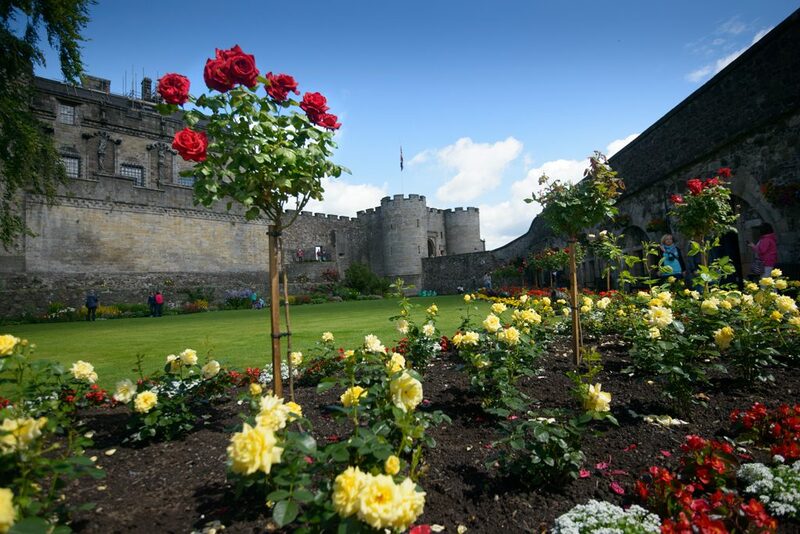 With summer here, the roses are now in full bloom – so why not take a trip to Stirling Castle and see them for yourself!